Who in their right minds would even contemplate creating a sequel to Blade Runner, easily one of the most influential and iconic sci-fi classics of all time? For all its flaws (from a glacial pace to a tendency to favour style over substance), Ridley Scott’s 1982 film remains a thoroughly original experiment that deftly juggles genres (sci-fi, noir, thriller) while serving up philosophical musings on humanity, identity and authority. It was groundbreaking, and has served as the template for countless movies and television shows since. To be fair, Blade Runner 2049 actually makes a pretty compelling case for a sequel. Its pedigree is fantastic: Denis Villeneuve, director of complex and arresting films like Sicario and Enemy, is at the helm, with Scott’s full blessing. The screenplay is co-written by Hampton Fancher (who dreamt up the original script almost four decades ago) and Michael Green (Logan). Harrison Ford has returned to play Rick Deckard, alongside some of Hollywood’s best character actors like Ryan Gosling and Robin Wright. The resulting film, however, is… a mixed bag. It’s clear in every frame that the creative team poured their hearts and souls into it. Their efforts are rewarded by the moments in Blade Runner 2049 that hum with the electric spark of old ideas made new again. Unfortunately, these don’t happen quite often enough to justify the film’s staggering running time. Unlike its predecessor, Villeneuve’s movie too often feels like it’s playing rather than changing the game. The world of Blade Runner is one marked by grey areas of the literal and moral variety. 35 years on from the first film, the increasingly self-aware androids created by the Tyrell Corporation – known as ‘replicants’ – have been refined by industrialist Niander Wallace (Leto). Unlike troublesome models of generations past, K (Gosling) is dutiful and apparently devoid of human emotion and entanglement. Indeed, his job is to serve as a blade runner – a cop who ‘retires’/de-activates rogue replicants – for the Los Angeles Police Department. 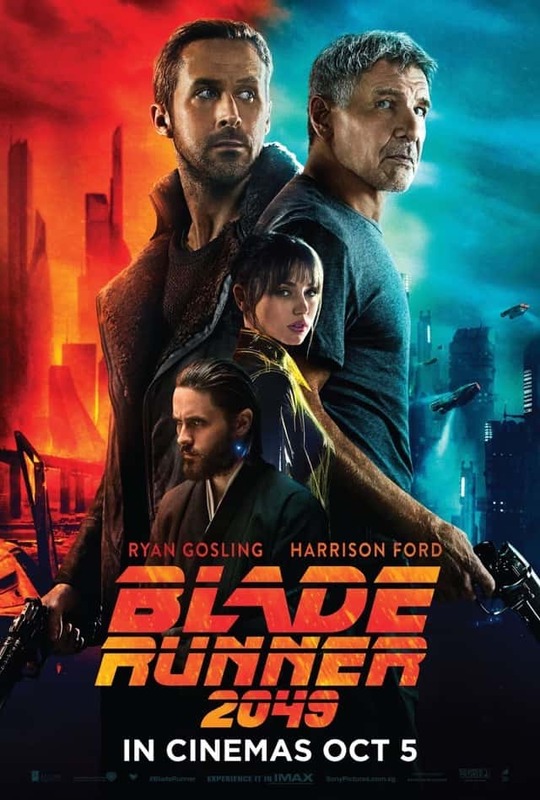 But, when he uncovers a buried box of bones on a seemingly routine mission, he’s led on an odyssey of self-discovery… one that leads him to a blade runner who’s long since gone off the grid: Rick Deckard (Ford). For the most part, Blade Runner 2049 does a decent job of channelling the spirit of Ridley’s film without coming off like a completely soulless retread. In effect, it’s exploring much the same territory – what happens when artificial life takes on emotional reality of its own? can androids be more human than humans? – with some clever twists on the ideas and moods that added such colour and depth to the first film. K’s existential crisis takes us through the very heart of this dystopian world, as the audience begins to see how he has been weighing his own identity against his programming all along. There are moments in the film that work quite well, mostly in depicting the almost devastating loneliness of the human – and replicant – condition. There’s something truly heartbreaking about K’s encounter with Dr. Ana Stelline (Juri), one of the world’s top memory designers. Immuno-compromised from a young age, she’s lived most of her life in a sterile, isolated environment – but nevertheless creates memories for replicants that fairly explode with colour and comfort. The inevitable clash between K and Deckard, played charmingly by Ford in full gruff hermit mode, affords this resolutely grave film a few welcome beats of levity. The trouble is that Blade Runner 2049 borrows its air of philosophical mystery from its predecessor, but doesn’t manage to sustain it. The film ends up laying practically all of its cards on the table – including some that stayed hidden from view in Blade Runner. There remains some ambiguity about Deckard’s metaphysical condition (thank goodness! ), but little much else. The questions it raises are uncomfortable ones too, altering some of the more intriguing dynamics in the first film – not necessarily for the better. It doesn’t help, either, that Blade Runner 2049 is arriving in cinemas in a media landscape that has been so indelibly shaped by its predecessor. The inner dreams and lives of androids and artificial life, so thought-provoking in the first film, are now the stuff of popular culture. More than once, Blade Runner 2049 tries but doesn’t find much more to say than the likes of Spike Jonze’s Her and HBO’s Westworld, which have explored the same themes with greater sensitivity and insight. At least Blade Runner 2049 has adopted a marginally more progressive approach to its female characters this time around. It’s not great that they exist primarily to serve as catalysts for K’s journey, but at least they’re there – in the roles of mentor (Wright as Lieutenant Joshi), muse (de Armas as Joi), antagonist (Hoeks as Luv) and more. If there’s one element of the film that deserves unreserved praise, it’s Roger Deakins’ absolutely jaw-dropping cinematography. Blade Runner 2049 is the most visually stunning film you’ll see all year – every frame is composed with an artist’s eye for the sublime, drawing beauty even from the bleakest of urban wastelands. Hopefully, his work here will finally win Deakins an Academy Award (he’s been nominated 13 times and not won once). In Hollywood history, only a mere handful of sequels have equalled or bettered their predecessors. Blade Runner 2049 is not one of those select few. It’s incredibly well and thoughtfully made and, thankfully, doesn’t disgrace or destroy the franchise to which it now belongs. But, if you’re looking for bold, brainy sci-fi that’s quite unlike anything you’ve ever seen before (like the original Blade Runner), you’d be better served by Villeneuve’s own modern classic, Arrival. Summary: Cerebral, rich and gorgeous to look at, Blade Runner 2049 doesn’t disappoint – but it doesn’t really excite, either.